Five-term Pennsylvania Senator and second newest member of the Democratic Caucus. PJV: I wanted to compliment you on the great courage and perseverance you have shown continuing to serve in the Senate as you have gone through chemotherapy in 2005 and again last year. You are really a role model for those who are fighting cancer. So my first question is: How are you feeling these days? I am feeling good. I play squash every day and I am at the top of my game. PJV: Very good. Of course, as a Senator you have access to the government health care plan. Do you think that all American’s should have access to the same quality plan? I do. I, as well as other Members of Congress, pay [premiums] for our health care, but we have a good plan and I would like to see everyone have an equally good one. PJV: Americans are spending more on health care than people in other industrialized nations, but it does not seem that our quality of health care is on par with that other countries are achieving. PJV: What about the question of whether or not we should have a single payer system or the idea of a public option? I am prepared to keep everything on the table. There is not much support in the Congress for single payer because of the concern about creating a big bureaucracy between the doctor and the patient. As to a public option I think we ought to include a public option so that people can have choices. I think Senator Schumer’s idea is a good one on this. He would have a public option provided that there is a level playing field. I have spoken on this extensively and we will send you additional information with the details. PJV: You are right that a lot of Congressmen and Senators are not on board with a single payer system or even a robust public option, polling is showing – a recent poll just came out showing 76% of Americans supporting a public option and even more overwhelming support among rank and file Democrats in Pennsylvania. Why do you think Congress is lagging behind the public on this issue? I don’t think Congress is lagging behind. There has been a lot of favorable comment about a public option. I can only speak for myself; I think a public option should be available as long as there is a level playing field. A lot of people like the insurance they have now and if they like what they have now they should be able to keep it. I think they ought to have a choice to do what they want. I want to also add an additional cost saving idea. From the experience I have had as a District Attorney, I think that if we prosecute white collar crime, white collar fraud in Medicare and Medicaid, I think we could cut back on government expenses. PJV: One last question on the health care issue. You mentioned the fear that a government bureaucracy would get in the way of individuals and the health care they need. Under the current system, the insurance companies require pre-certifications, and people have to file claims with their insurance companies and the companies have a financial incentive to deny claims and deny treatment. How would you characterize people’s fear of government bureaucracy when the current system is a corporate bureaucracy? I think that will be taken care of by having a public option so that people can make a choice. There are a lot of people who are very happy with their current insurance and they can have the choice of keeping it or they can have the choice of a public option. And I am prepared to keep the single payer system on the table and to discuss all options. I think it is important to approach this problem with flexibility. PJV: Now, moving to the Middle East. Concerning the crack down and the protests following the Iranian elections, what do you think are the implications for the Middle East in general and particularly for Israel? I believe once the genie is out of the bottle that public sentiment will predominate. Whether it will be a matter of weeks or of months, I think it will come. I agree with what President Obama has done setting December as a benchmark for resolving the issue of Iran moving toward a nuclear weapon. I think that is a very good development. I agree with the President in convening multilateral talks because if we are really going to reign in Iran we are going to have to have the help of the Chinese and the Russians as well as the Western democracies. I think that it is sound, given what Amadinjad has done, that we not pursue bilateral talks at this time. PJV: This last week since Al Franken joined the Democrats in the Senate bringing your numbers up to 60 once Bernie Sanders and Joe Lieberman, the Independents are included. There is a lot of talk about whether the Republicans will still be able to filibuster. Do you think that the Democratic caucus has the same kind of discipline as the Republican caucus? I believe that the Republicans have engaged in filibusters that were unreasonable. For example, I thought the Republican position on the stimulus package was not soundly based. I think the 60 votes will enable the Democratic caucus to overcome those unreasonable filibusters. I agree with the conventional wisdom that the Democratic caucus is not monolithic - there are different points of view – but I think as a generalization 60 votes will be influential in defeating Republican filibusters. PJV: Recently, Sen. Bernie Sanders (I-VT) floated the idea of calling on Democrats to support cloture on bills that are supported by the caucus even if individual senators do not support them for one reason of another. What are your thoughts about that? I think we have to take Sen. Sanders’ suggestion and consider it. I think that its good generalization, but you have to really take the issues up one at a time and see exactly what they mean. PJV: The next question is about the hearings you just sat through on the nomination of Judge Sonia Sotomayor to the Supreme Court. There seemed to be very different messages coming from Demcrats and Republicans. While the odds seem good that she will be confirmed - in fact, Sen. Lugar (R-IN) just announced he will vote for her - the Republicans seemed to be in lockstep focusing on a few specific issues. Do you think that the hearings helped to move closer to a bipartisan vote for her or do you think the party line questioning is reflective of what will happen on the floor of the Senate? It is always hard to predict, but I believe there will be a fair number of Republican votes for her. PJV: How do you think she did in responding to the questions and answering the criticisms? I think there was much too much focus on the Latina woman issue. I think it is understandable that she would make a statement that as a Latina woman she was competent. We have to take into account that for a long time women were denied the right to vote. There is still a glass ceiling; women are limited. There are only 17 women out of 100 senators. And when you talk about an Hispanic there is an undercurrent of questioning about ethnic competencies and I think it is understandable that she said that, and I think much too much time was spent on it. Similarly, I think much too much time was spent on the issue of empathy. The whole history of the court has been to adapt to an expansive view of Constitutional rights and evolving values. I would have liked to have seen more discussion on some critical issues. For example, there is an important case being brought by a Philadelphia law firm representing the survivors and victims of 9/11 which the Supreme Court declined to hear because the State Department did not want to impede our relations with Saudi Arabia; it was the victims vs. Saudi princes. That is an important issue of separation of powers. Congress has defined sovereign immunity to exclude incidents like flying an airplane into the World Trade Center. I would have liked to have seen more discussion on big issues like that, and we did not spend enough time on those issues in my opinion. PJV: On the assumption that Judge Sotomayor will be confirmed, do you think it will make a difference having another woman and the only Latino voice on the Court? Yes, I do. I think she will bring a very different perspective. When Thurgood Marshall joined the Supreme Court in 1967, Louis Powell said that just his presence in the room made a difference. I think she will bring a different life experience; I think it is important that Hispanics be represented and that there be more of a woman’s point of view. The 17 women in the Senate have certainly added a very worthwhile dimension and I think another woman on the Supreme Court will too. PJV: While we are discussing the Judiciary Committee, in 2004 the question of reproductive rights played a big part in the election campaign. You talked about using your position of Chairman of the Committee at that point to block any judicial nominees who were going to be anti-abortion idealogues. Shortly after the election there was a firestorm of criticism from the right and you appeared to back off of that position. Do you feel that you have changed your position in response to threats to remove your chairmanship of the committee? What I said was that nominations to the court would have to take into account the views of pro-choice Senators. I did not stake out a position because I have voted for both pro-life nominees like Justice Scalia and Chief Justice Rehnquist and I voted for pro-choice nominees like Ruth Bader Ginsberg and Stephen Breyer. What I said was, if you go back and look my words specifically, that there would have to be consideration of that. It was blown all out of proportion, but my views have remained consistent. 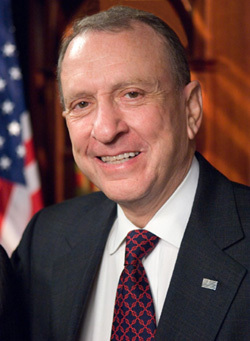 Nate Silver notes that Arlen Specter's historical voting patterns vary depending on whether he is being attacked politically from the left or the right. Specter ranked among the most liberal Republicans until the March 25 Quinnipiac poll revealed he was trailing Republican rival Pat Toomey by 14 points. Specter then tacked to the right. Further polling made it clear that Specter could not beat Toomey in a Republican primary, so Specter switched parties on April 28 and become one of the most conservative Demcrats in the Senate. 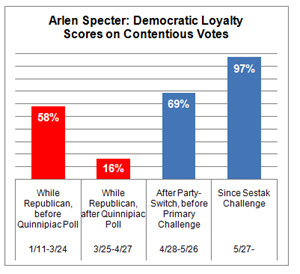 Then on May 27 Rep. Joe Sestak (D-PA 7) officially challenged Specter for the Democratic nomination, so Specter has been toeing the Democratic party line ever since. What direction will Specter take once when and if he wins the nomination? PJV: The final question is about the upcoming Democratic primary and the issue of party allegiance. There has been a lot of back and forth between you and Rep. Sestak. What do you think the role of politics is for someone in the military, as Congressman Sestak was for years? First, let me address your question about voting like a Democrat. Over the years I have really sided with the Democrats very often. For example, before I changed parties this year, I voted in favor of overruling the Lilly Ledbetter decision to give women the right to sue for discrimination; I voted for children’s health care; and the big vote was the stimulus package which was a sort of watershed vote between backing Obama and the Republican filibuster. For years I had been encouraged to become a Democrat by Biden, Rendell, and Majority Leader Senator Reid. After the stimulus vote I was finding the Republicans too were urging me to become a Democrat, so I did. When you talk about the military, I believe that “Don’t ask; don’t tell” is not an appropriate standard. Gay men and women have given life and limb in service in the military and there ought not to be a question about that. PJV: You mentioned that Rep. Sestak was not active in the Democratic party until 2006 when he decided to run for Congress. Do you think that would have been an appropriate thing for him to do before then when he was in the military? I did not pick that fight. He challenged my voting preferences which have been strong for labor, for example. Labor characteristically only backs Democrats, but they backed me because I supported the minimum wage and unemployment compensation. When he challenged me on my standing as a Democrat, I pointed out that he only became a Democrat in 2006 to run for Congress. And there are plenty of people in the military who vote in primaries. His voting record [is very poor. Now he is doing the same thing in the Congress.